Hichki is the comeback film of seasoned actress Rani Mukerji. Read the comprehensive review of the film only on BollywoodMDB before booking your tickets. 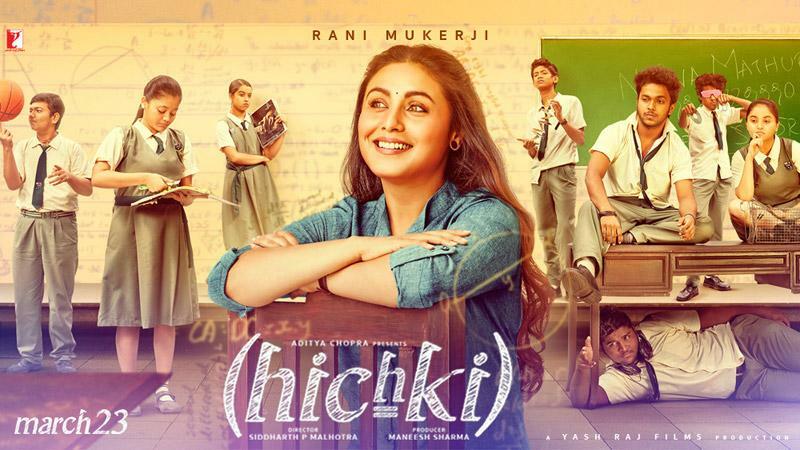 Inspired by the 2008 film Front of the Class, which was based on the book of the same name, Hichki revolves around Naina Mathur, a woman with Tourette syndrome. She has only one dream in life - to become a teacher. However, no prestigious school wants to take onboard a teacher having Tourette syndrome. Naina has never been the woman who gives up so easily. Coming from a dysfunctional family, she knows how to face challenges. So she fights and tries her best to achieve her goal. After a spate of disappointments, Naina finally gets a job at a premier school in the city. However, the class she has been assigned by the principal comprises of mischievous and prankish children who come from the economically backward section of the society. Naina is not at all anxious, despite knowing it well that it’s not going to be a smooth ride for her. But will the whole class accept her new teacher? Will Naina be able to cope with their idiosyncrasies and unruly behavior and bridge the gap that lies between other students of the school and those who get admission through Right to Education Act? After impressing us with her powerful performance in Pradeep Sarkar's cop-drama Mardaani, Rani Mukerji comes back with yet another content-driven movie. The actress plays Naina Mathur, the girl suffering from Tourette syndrome, with peerless conviction. With her impeccable acting talent, Rani brings the character to life. You feel every emotion which her character goes through on the screen. You will long for her to return to the screen when she is not there in the frame. There is a bunch of supporting actors in the movie and each one of them lends their full support to ensure that Hichki turns out to be a sweet film. Especially, the work by child artists who play Rani’s students is commendable. Siddharth P Malhotra has previously helmed the Kajol and Kareena Kapoor Khan starrer We Are Family. He returns to direction after 8 years. Apart from calling the shots, Malhotra has also co-written the film with Ankur Chaudhry. While his direction is competent, we cannot say the same about his story. It’s not something out-of-the-box. But with the help of his directorial skills and, most importantly, a stirring performance by Rani Mukerji, he makes his film highly likable. He fills Hichki with a huge emotional depth and that is the biggest victory of the film. Cinematography by Avinash Arun is perfect. Despite being simple, it is appealing to the core. The production value of the film is good. Selection of real locations where needed adds authenticity to the whole film and its setting. Sound designing is excellent and so is the background score. Editing of the film is also very crisp. You hardly find scenes which drag the narrative, which is indeed a good thing. Overall, Hichki is good in all technical departments. Music composer Jasleen Royal does a good job in bringing out an album which is thoroughly likable. The more you listen to it, the more it grows on you. Her seven-track album is like a breeze you want to enjoy every now and then. Since not all songs are part of the narrative, you will have to listen to them separately. Hichki is charming and moving and has its heart in the right place. With Rani Mukerji’s power-packed performance, which has so many emotions blended into one, it becomes a must watch. It is a good family entertainer for the weekend. Rani Mukerji wants to do either Mardaani 2 or a romantic film!